From the Breviary according to the use of the Roman Curia, 1529, the end of the sermon for the second day in the Octave of All Saints. We believe that this day’s festivity also belongs to the priests of Christ, to the doctors, levites and other confessors and monks; in whose hearts virtue flourished, because the world had faded away. Because the will of the flesh was mortified, true charity was fervent in them, and because they were dead to the world, they lived within in it as the Saints live in Heaven. For the more a man takes delight in this world below, the more is he separated from the love of the things of Heaven. Therefore, these holy men, fleeing the world that passes and the corrupting passions of the soul, had God before them and the Angels at their sides, and so merited to be brought by the Angels into the kingdom of Heaven. What does it profit the Saints that we should praise them or glorify them? What does this solemnity of ours benefit them? What are earthly honors to them whom, according to faithful promise of the Son, the heavenly Father honors? What are our commendations to them? They are full. It is indeed so, dearly beloved; the Saints have no need of our goods, and our devotion gives them nothing. It is for our sake, and not for theirs, that we honor their memory. … It is commonly said, “Out of sight, out of mind”. (literally “What the eye sees not, the heart does not long for.”) The memory is a kind of sight, and to think of the Saints, is to see them in a certain way. Such is our portion in the land of the living; no small portion, indeed, if love accompany remembrance as it ought. And so I say, our dwelling is in heaven, though in manner very different from theirs. For they are truly there, where we long to be; they are there in presence, we only in thought. 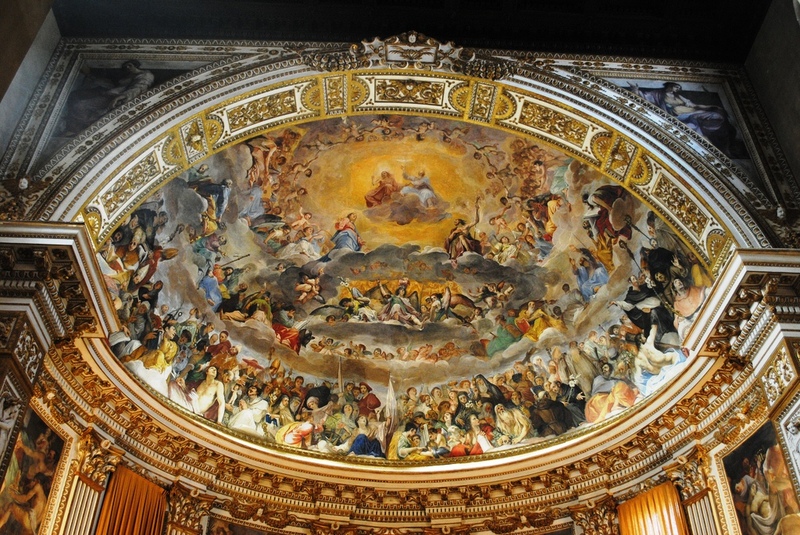 The Glory of All the Saints, by the Tuscan painter Giovanni da San Giovanni, 1630; fresco in the apse of the church of the Four Crowned Martyrs, Rome. The Saints to whom the church pictured above is dedicated, known as the Four Crowned Martyrs, have shared their feast day with the Octave Day of All Saints since the latter was instituted by Pope Sixtus IV in the 1480s. 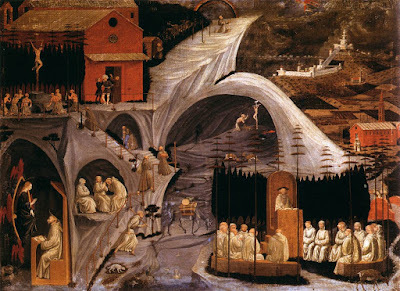 The choice of motif for this fresco was most likely determined by this fact; every type of Saint imaginable is shown beneath the Holy Trinity in glory. Each year on the feast day, the altar is decorated with one of the most beautiful antependia in the city of Rome, and silver reliquary busts of the martyrs are placed on the balustrade of the sanctuary. The crypt where the relics of the martyrs are kept in three sarcophaguses, directly beneath the high altar.